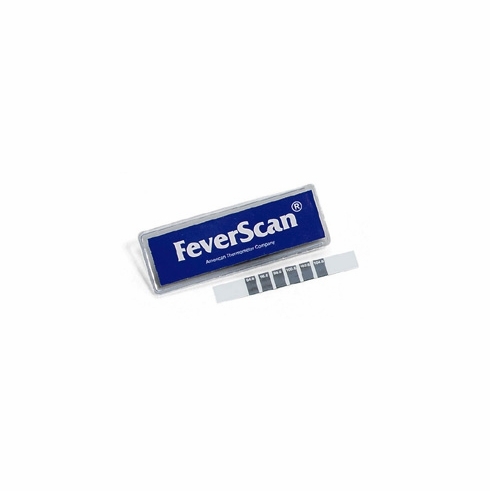 FeverScan 32-0432 Thermometer ReusableFever Scan Thermometer Reusable, Item # 32-0432, This slick little easy-to-read forehead thermometer is excellent for quick assessment purposes. Comes with a protective vinyl sleeve and provides temperature reading in Celsius and Fahrenheit. Fever Scan Thermometer Reusable, Item # 32-0432, This slick little easy-to-read forehead thermometer is excellent for quick assessment purposes. Comes with a protective vinyl sleeve and provides temperature reading in Celsius and Fahrenheit.Thermometer Feverscan responds in 15 seconds while monitoring temperature changes continuously. No need to reset. Flexible material with an easy to read temperature indicated by a green box on a large liquid crystal display. Latex free, contains no mercury.